Since 2003, Amtrak has been complaining about the condition of the bridges along the corridor it owns in eastern Connecticut between New Haven and Providence. Three specific spans – above the Thames, Niantic, and Lyme rivers – were so old and poorly maintained that if Amtrak didn’t do anything to bring them up to date, a shutdown of New York-Boston service might have been necessary. Fortunately, Amtrak found the funds last year to renovate the Thames River Bridge. Now, the national rail company is moving on to its Niantic River passage, near the town of East Lyme. Vice President Joe Biden made the announcement at Washington’s Union Station where he praised Amtrak repeatedly and said “I’m tired of apologizing for help for Amtrak. It is an absolute national treasure and necessity.” Mr. Biden said that of the $1.3 billion Amtrak received in the stimulus bill, $105 million will go to the new span over the Niantic. Replacing the bridge will allow Amtrak to maintain existing speeds along the Northeast corridor for Acela and Regional trains. 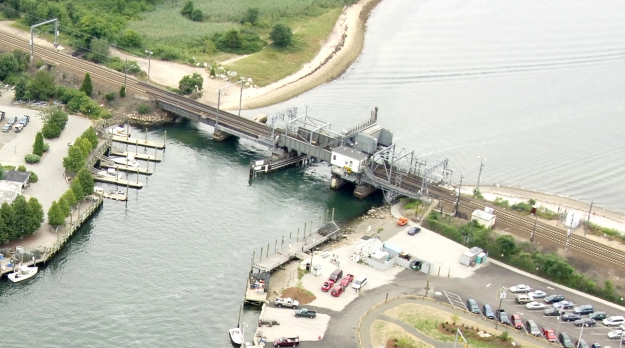 The 100-year-old drawbridge (pictured above) currently only allows one lane of boats to move through when it opens, but the replacement will allow two, making the passage faster for boaters and, as a result, for trains. $82 million of other stimulus funds will go towards the rehabilitation of 68 of Amtrak’s disused rail passenger cars, which will allow for increased service and passenger capacity on lines throughout the nation. These upgrades to car interiors and mechanical systems will be made at rail facilities in Indiana and in Delaware. The Northeast Corridor, which suffers frequent power failures, will receive $63 million for improved catenary power supply. Wilmington, Delaware’s downtown train station will get $21 million for a new platform. These improvements leave Amtrak with a maintenance backlog of about $5 billion. The remainder of the stimulus funds dedicated to the Amtrak system have yet to be apportioned. This is great and all. I love to see the government invest in public transit… but did anyone realize that Wilmington is the only train station that is getting a “glass stairwell enclosures, canopies” along with the necessities to bring it up to spec? Sanford Auto-Train Station has reached a point beyond full capacity. The original station waiting room can only hold 15-25 percent of the total passengers that board a sold out train. A temporary tent has been constructed on site to provide additional waiting facilities but is still not capable of holding the total number of passengers that board a sold out train.